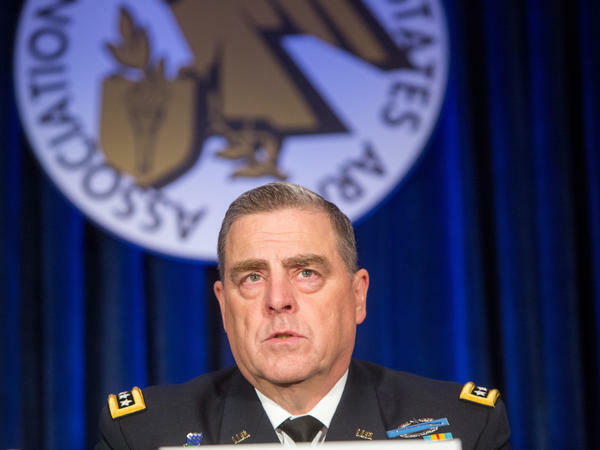 Army Chief of Staff Gen. Mark Milley speaks on a panel during the Association of the United States Army's annual meeting on Oct. 5. 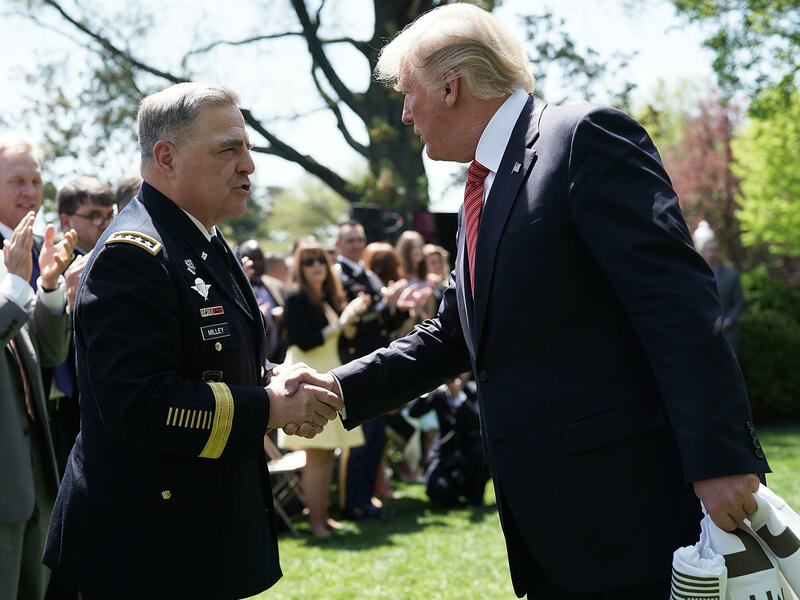 President Trump shakes hands with Milley during a Rose Garden event with the Army Black Knights football team of the U.S. Military Academy on May 1. 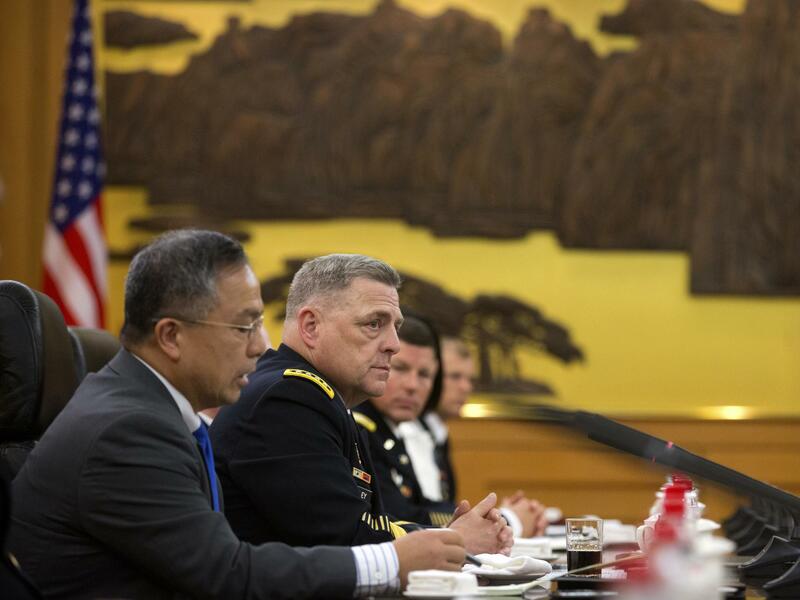 Milley looks on during a meeting with the leadership of China's People's Liberation Army in Beijing on Aug. 16, 2016. Army Gen. Mark Milley, the service's top officer who was nominated Saturday by President Trump to be the next Joint Chiefs chairman, is a rarity among senior military officers. He did not attend one of the service academies, but is an Ivy League graduate. And he played on Princeton's hockey team. If approved by the Senate, the 60-year-old officer from Massachusetts is expected to take the helm next summer from another Massachusetts native, Marine Gen. Joe Dunford. But that could all happen sooner. After announcing Milley, Trump tweeted, "Date of transition to be determined." Milley was at times considered a long shot for Joint Chiefs chairman, who serves as the top military adviser to the president. Others in contention included Adm. John Richardson and Air Force Gen. David Goldfein. Sources say some of Defense Secretary Jim Mattis' aides this week were still betting on Goldfein. Milley is a chatty, quick-witted, barrel-chested officer who seemed to click with Trump. At times they could be seen laughing together, or sharing a joke. During a Medal of Honor presentation in June, Trump pointed to Milley, seated in the front row. "A very good negotiator, Gen. Mark Milley," Trump said. "I could see in his eyes when I talk about the cost of those bombs. He's good at throwing them, but he's also good at pricing them. Right? I see it." The general has a voracious appetite for history, especially military history — and Boston sports teams. On a trip to the Mideast region in 2015 , and appearing before soldiers, Milley traded barbs with those who thought New England Patriots quarterback Tom Brady was involved in "Deflategate." On that same trip, stopping in Baghdad, he pressed senior Iraqi officers to move faster in their fight against ISIS, repeatedly asking for a timetable to take back the city of Mosul. Not long after, Milley insisted — over objections from local officers — on traveling to Egypt's Sinai Peninsula, inspecting a camp of U.S. and international peacekeepers that was under occasional attack by ISIS fighters. Milley was key in getting some of those troops moved farther south to a less dangerous camp on the Sinai Peninsula. The general will engage anyone who will listen about history. A Japanese battle flag hangs inside his house, Quarters 1, at Joint Base Myer-Henderson Hall, in Arlington, Va. It was grabbed by his Marine father who fought in the Pacific during World War II, hopping through the islands of Kwajalein, Saipan, Tinian and Iwo Jima. Milley can swiftly shift from talking about World War II to the Battle of Bunker Hill to the Korean War to the Afghanistan War. All seemingly without taking a breath. At times, even other Army generals will privately groan about Milley's constant history lessons; it leaves little time for current business. The general earned tabs as an Army Ranger and a Green Beret, and he has extensive combat experience, taking part in operations in Panama, the Balkans, Iraq and Afghanistan — where he once served as the No. 2 officer. Milley has been Army chief of staff since 2015, where his job is to make sure the Army is trained and equipped. He had this to say at his Senate confirmation hearing: "Our fundamental task is to win, to win in the unforgiving crucible" of combat. He told the senators that the Army has a variety of tasks, including humanitarian assistance and training local forces in other countries. "But our very reason for being, the very core of what it means to have an Army, it's to win and to win decisively in ground combat against the enemies of our country so that the American citizens can enjoy life, liberty and the pursuit of happiness." Officials told NPR that among the Joint Chiefs of Staff, Milley is particularly focused on the North Korean threat, making sure Army troops are trained for any possible contingencies. Milley said at a conference last year that a "full blown war on the Korean Peninsula will be horrific by any stretch of the imagination." But Milley said that North Korea possessing a nuclear missile capable of striking the U.S. would be unacceptable. "It would be horrible, there's no question about it, but so would an intercontinental ballistic missile striking Los Angeles or New York City," he said. "That would be equally horrible."